I wrote this piece a few weeks ago and shared it with one of my yahoo groups. it has been requested to be reprinted in various news letters and e-zines and blogs. Yes it needs editing I hope they do it I am dyslexic so I can’t do it. I’m still writing it and on my compute it’s actually getting alot bigger but here is todays medium version. My early days were spent in San Diego and Hollywood. I danced with George Kayat at the Ali Baba Club, Maroon Saba at the Fez, Aziz Katra, John Bilezikjian at the Apadonna in New Port Beach, Raja Zahr in LA and Las Vegas, Harry Saroyan various places, Antwoine Hage at Haji Baba, , the Greek Chicago bands at Athens West in La Jolla, and the Harem Caravan* Review at the Ramada Inn. I moved to Seattle in 1977. I dance with who ever was playing at the Lebanon Restaurant and over 10 years with Takis Doties at The Grecian Corner followed by The MB Orchestra at George’s Bar & Grill and David Said at Kolbeh’s Persian. I toured and danced with all sorts of bands across the country during my career; Brothers of the Baladi, Transarabian Sound, Ibraheim Turman, Oasis, Doug Adams of Light Rain, Steven Flynn . . . Then in 1992 I began a very close relationship with Sirocco from Santa Cruise. They came to 15 of my Hawaii Retreats and we made many DVD’s together. Currently I perform mostly with the full 6 piece music arabian music ensemble called House of Tarab. Last night I enjoyed dancing to Naseem Band! Wow, that was fun to recall all that history! Most of the parties and restaurants I danced in hosted families and little kids were encouraged to put tips in my waist band. Many performances were sacred sacraments of divine grace under a mirror ball and some down right rowdy and profane with Greek sailors showering dancers with hundreds of dollar bills. The Greeks also broke dinner plates. It was a ritual of releasing the attachment to possessions and embracing LIFE in-the-moment! In the 70s I danced for 45 minutes per show. There was not one hair on my head that was not soaked in sweat. My stamina was incredible and I felt like a cosmic astronaut rocketing into out of this world trance spaces. I deffinetly enter zones and trance states when I perform. In ancient, tribal and current society the trance is a big part to the dance. The trance state is a means of communion from the beginning of time. The average Arab knows ” tarab” as the divine ecstasy the listener gets into as part of the experience of focused listening to the music. The dancer is a vessel; a container of the human interface. In the Haitian/African Voudoun religion the trance state is a means of divine contact and interaction. In the Turkish (Mid Eastern) dervishes ecstatic spin she/he stands on the threshold between worlds; the mundane and greater whole. The zar as practiced in Egypt and parts of the Mid East is a similar cathartic experience and is often used in belly dance routines. The Guedra of North Africa uses repetitive hand gestures and chanting to attain trance states. Am I praying or worshipping? Not in my mind. I am more of an explorer. This being-in-the-moment with your physical dance experience is valuable and transfers something vital and essential to our souls. You, your body, your emotions, the cosmic vibrations of music, time, space, spirit and accelerate rise in body heat and blood flow. It’s healing for the body. It’s especially important to us in these days where we are leaving the body behind more and more. Todays technical world is sadly lacking these opportunities as we sit daily addicted to our physically passive computer screens. However, we do become unwittingly vulnerable to internet trance states where the influences are not divine links but rather mediums for commercial gods and goddesses to commune with us. As I dance I create my dance in the moment. I have seen dancers do this effectively with only knowing 5 moves. Knowing 5 moves or 500 moves does not necessarily make the dancer better. It’s all about what you do with what you know. 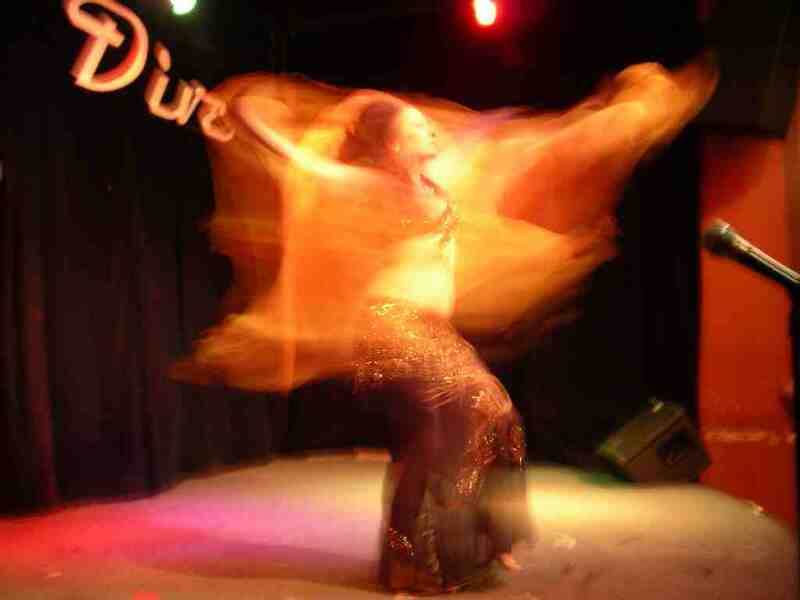 I feel this wildness and openness of spirit is something exceptional belly dance avails to us. It should berevered and held on high. Not that it negates choreography. It is just that at this point in society we have many dances that are contained and choreographed . We have fewer options that are un choreographed and free. Improvisational dance holds essential skills that benefit our life experience in important ways. Do you live a choreographed life day to day? Maybe so. I don’t. Improvisational dance does not mean you do not study rhythms, music, learn moves, develop your skill set, practice combos, condition the body and work to increase flexibility and endurance. It does not mean you do not have an intended destination either. You just navigate differently. Your moves become your paints. When we watch an improvisational belly dance, we are witnessing the painter painting. The dancer shares the live, active creative process with you. She listens carefully to the music and opens her heart and soul to be like a tuning fork and resonate with the vibrations in the air using time and space. With each breath she is inspired to unfold the next movement in time. The spirit provided the force behind the motion. We call this dynamics. We all are individuals and this is an opportunity for individuality to shine. The challenge is to be relaxed enough to allow the exhibitionist to step forward. There lies the hitch. We are told at an early age not to show off. Do not indulge your self. This comes from our old puritan roots. However, all artists are indulging the stuff that makes up their lives. We call this expression. Teachers tell their students, never do this or that. The “ don’t touch your own body” policy is just a stupid lack of appreciation for the marvelous gift of life you have been given. Hello! It’s your body touch it if you want to! So check to see if that is in the back of your brain and get rid of that pilgrim it if you want to really dance. Whether you are dancing for your self or for an audience or both, you must be open, know your body and accessible to your emotions. Available, vulnerable and shameless. I often think about the stewardess directives to put the oxygen mask on yourself first before the child next to her. This is because if Mom dose not take care of her self first she will not be any use to that child that is dependent on the adult. If we do not invest in our internal life experience and take care of ourselves first, we will not have much to say. I cannot share any of my cookies with you if I have not baked any. An authentic dance comes from an authentic life. I think this is one of the best kernels this dance has to offer all of us. It is the metaphor that life is one long dance from birth to death. To choreograph or to live in the moment is worth thought. Who choreographs your life? You, your mother, father, brother, husband, church . . .? The fear of not having anything to say is what often drives us to want a choreography. The fear that what we have to offer is not any good. The notion that yours is better than mine, so teach me your dance. So sad when self esteem is so poor that we would rather do the dance of someone else. Or that we could only have one idea and we cling to it and keep using it over and over again in repetition instead of taking a risk and trying something new. The new is our growth. Some of us can dream up dances and have others implement them. I think the desire to save dances as original choreographies is a kin to video taping them. The memorization that goes into a paint by number dance is very left brained. The right brain synthesizes things. The left brain sequences things. The left brain judges (and leads to self criticisms) and the right brain is metaphoric and sees likeness. To make a choreography work it must move from analytical left brain to the right. Some humans are skilled at this others can quickly synthesize intuitively. Often we have learned to feel more secure when things are organized and set. I say learned because children do not usually mind disorganization. It is adults that require and maintain order. If we learn skills for being comfortable in chaos we have a skill for life. The universe supports chaos, if not more, than organization. Organization comes out of chaos. (I studied with Gabriel Roth and she taught me about chaos). If everything is tightly organized there is little room for creativity. I don’t mean for it to be a contest here. I am only trying to illuminate some factors that may limit our personal growth. If you liked your self and the picture you create with your beautiful box of crayons, then you carry a sense of pride. We recognize a child’s sweet sense of accomplishment and pride about creating his/her picture. That experience of drawing, is full of lines, color, space, time, rhythm, design, breath and heart beats. We come away from these experiences liking our selves and our lives (or well we should). I think to ignore, devalue, not see the merit of your own creative process is a contributing factor to all the depression and loneliness people feel these days. Pride coupled with compassion leads to strength and greatness. The lack of pride leads to not even finding compassion for ones self. Choreography teaches us about process and transition. It allows us to put our best tricks forward in the shortest amount of time I suppose. In a sound bite. Since we are all so busy and there are so many of us now a days, that a sound bite is all we have time for it seems. However sound bites leave out plateaus and thresholds to new zones of physical and psychic trance expression only attained though longer durations of time. Real breath, real heart beats and body heat are necessary ingredients. This is where dance crosses over and can become prayer or communion with ones maker of some sort, and this is what has some religious folks scared. I do not what they are so afraid of, but I think it boils down to putting the clergy out of a job if people realized they can contact god all by them selves without the need of a clergy man/woman. I tell my students when their shoulders are locked to think of something they love to do. The shoulders are about passion and our sensibility. I direct them to practice rolling their shoulders while eating a chocolate dove bar or relaxing in a hot tub. When you learn that that story is in those body parts the stories begin to unfold. I often say to a new performer that if you step on stage you are accepting a responsibility to perform. A contract. The only way you let that responsibility down is by not understanding and accepting the rules of the contract by performing. You must be an exhibitionist. Some dancers appear to have stepped on stage and left themselves at home. It is really simple; tell me a story. In the case of dance, it is with your body language this story unfolds. There are millions of stories that can be told with the accompanying music. Our bodies can express more than spoken words. It not linear. It is multilayered, way more complicated than spoken or written words. If we are comfortable with the human body, we know it innately because we share the experience of being human. We know it with out a translator. So what story do you need, desire to share? Do tell it with out a choreography sometimes?